We’re happy to say that the workload on the visual design team has pushed us to add one more to the group. We’re even more excited to say that Julia Jouravel is the newest member of the Fuzzy Math team! After our job posting was up for a couple days, and we reviewed many, many candidates, Julia stood out from the crowd. 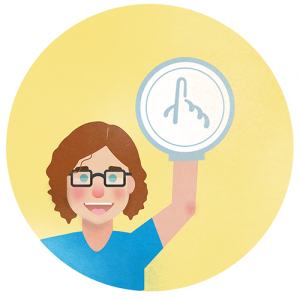 Her portfolio was a nice mix of illustrations, print, and of course, great looking interactive work, but it also stood apart because her intro email was accompanied by a wonderful illustration of Julia as Fuzzy Math’s #1 fan. After interviewing Julia, we liked her even more: well thought out designs, an understanding and interest in the UX process, strong communication skills, and just seemed like she’d be a great fit in the office. She’s been with us for three weeks now, and we’re happy to say that all is true. Julia also keeps our non-Midwest hiring streak alive, as she joins us from Novosibirsk, Russia (by way of Naperville). So maybe not? Either way, welcome aboard, Julia – we’re happy you’re here!